Chicago-based reporter Camille Preaker travels back to her hometown of Wind Gap, Missouri, to investigate a rash of murders targeting the town’s children. I think I bought this book shortly after I had read Gone Girl in 2014. 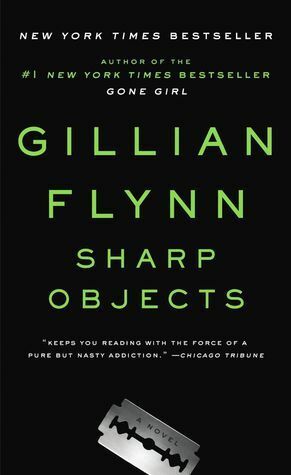 I was desperate for more Gillian Flynn. However, the book sat on my shelf, unread, for four years. Then HBO announced an eight episode limited series adapting the novel and with the series about to hit screens this month, I figured it was time to pick it up. Sharp Objects is an excellent, atmospheric story that cuts to the core. Coming from a cramped community myself, I related a lot to the close-knit cliques and gossipy gabfests that make up small town life. Everyone is in everyone else’s business because really, there isn’t anything else to do. While I love my crime fiction to blossom within a sprawling urban setting, there’s nothing like shoehorning a plot into backwoods rural America where the victims and the perpetrators alike feel the claustrophobic pressure of the violence. The lead, Camille, is a tragic, desperate character who despite a tough demeanor, is consistently on the verge of total collapse. This makes her the perfect lead – she’s clumsy, she makes a whole hell of a lot of bad decisions and mistakes, but Flynn does a great job in allowing the reader into her life, fully and completely. Keep in mind, she’s the only one you’ll really get a good look into as everyone else is harboring their own secrets and intentions. There’s a wide cast of characters and although there are only really a handful of those you suspect behind the murders – not many give you reasons to look upon them favorably as human beings. Like Gone Girl, this is a book where the less you know going in, the better, so I’ve tried to keep it as vague as possible. Trust that if you enjoyed Gone Girl, you will probably like this one just as much – if not more. Gillian Flynn has a way with words, offering up quotes that will stick with you in the long run. I look forward to checking out the rest of her work.